Herluin Lothaire is a Breton apothecary who operates a shop at the Ragged Flagon. 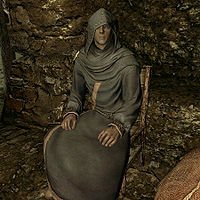 He will move in after you have completed two Thieves Guild special reputation jobs for Delvin Mallory. There is a usable alchemy lab inside his shop along with various potions and poisons. Herluin will spend all his time serving his shop. He can be found sitting on a chair or working at the alchemy lab present in the store. He will not barter with you if you have upset the Thieves Guild by breaking one of their rules. He will not offer you his services again until you pay for your offense. Herluin wears blue mage robes and a pair of boots, and is equipped with a leveled dagger which can be up to elven quality. He carries three leveled soul gems, of which two of them are filled, as well as a small amount of gold. He knows the Alteration spell Oakflesh, the Conjuration spell Conjure Flame Atronach, the Destruction spells Firebolt and Flames, and the Restoration spells Fast Healing and Steadfast Ward. Although selling both potions and poisons, Herluin appears to have a much greater interest in poisons. He will often greet you with an introduction he enjoys very much: "So, name your poison! Ha ha ha. Oh, I never get tired of that one!" He will then offer to sell you his poisons: "Need some sort of toxin for a special occasion? That's where I come in." He will then elaborate on this: "I sell all sorts of poisons for almost every occasion." When you have offended the Thieves Guild, he will not want your business but will give you some advice: "You want my advice? Pay your debt to Vex quickly and she'll forget the whole thing." This is the merchandise found in Herluin's merchant chest. These items are only available if purchased from the merchant; they cannot be pickpocketed or stolen. They are restocked every two days. This page was last modified on 4 January 2014, at 17:29.